Purchased by J. Pierpont Morgan (1837-1913) in 1900. Arms on title (a rosette between S and P); black armorial stamp (17th-century); bought (June 14, 1632) by Jacques Debane, canon of the Cathedral at Viviers (Ardèche); sold (Oct. 1860) by D. Appleton to Theodore Irwin (cat., 1887, p. 372, no. 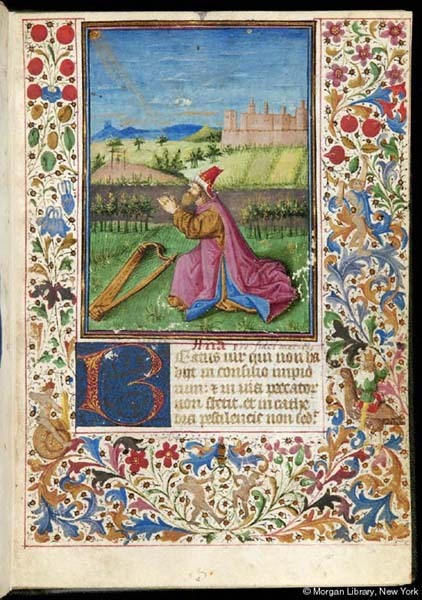 2301); said to be a Guillaume Libri manuscript (cutting from a Sotheby's catalogue); purchased by J. Pierpont Morgan (1837-1913) with the Irwin Collection in 1900; J.P. Morgan (1867-1943). Ms. psalter-hours for the use of Rome; written and illuminated in Provence, France, ca. 1460.